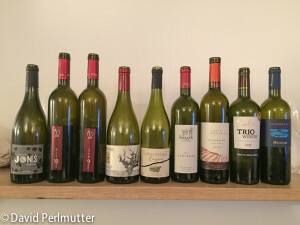 The tasting started off as being a small one of four or five wines, turned into a slightly larger event with nine wines, including two from the Languedoc and one from Sardinia, once fans of this variety heard of the tasting – Carignan tastings are not a frequent occurrence. David Perlmutter, the organiser, and Yotam Sharon, one of the winemakers, wrote up the tasting, held at the Shulchan Restaurant in Tel Aviv. Below are my tasting notes of the Carignans I tasted in Israel. Those marked with a * were tasted at the Carignan tasting. Two distinguishing features of the Israeli wine scene are the importance of the winemaker and the fact that very few wineries own their own vineyards but work on long-term contracts with grape growers around the country. One problem in making quality wine in a hot climate is the need to harvest early to retain acidity. For some varieties this means that while they are fresh with good acidity, they lack fruit weight and definition and the tannins are green. Due to the high acid in Carignan, winemakers can harvest later in the season, giving good fruit character, ripe tannins and still have great acidity. 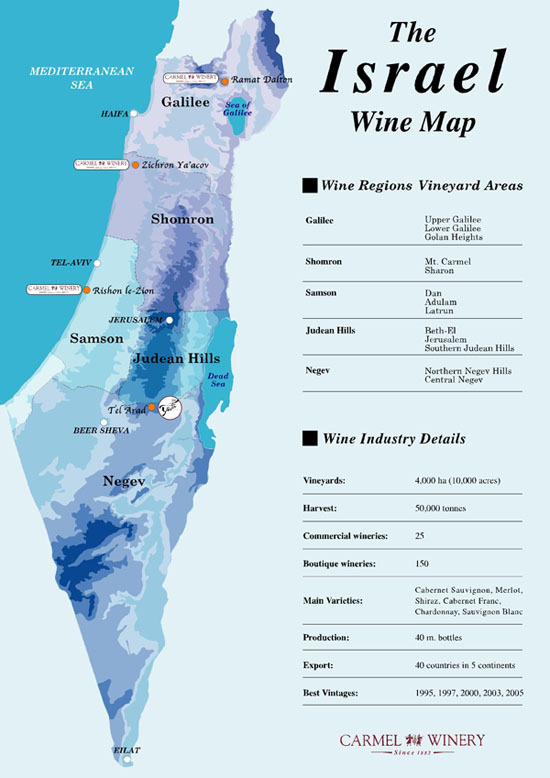 Carignan has been grown in Israel since the 1880s, when it was planted by Baron Edmond de Rothschild, especially in the vineyards of the Shomron area. The main concentration of vineyards is in the valleys surrounding the towns of Zichron Ya’acov and Binyamina, benefiting from the southern Carmel Mountain range and cooling breezes off the Mediterranean Sea. Elevations rise from 0 to 150 meters above sea level. Soils vary from calcareous clay, terra rossa, limestone and chalk. The climate is typically Mediterranean. Annual precipitation is 400 – 600 mm. The Carignan vines used in this selection of wines are not all old, ranging from 20 to 50 years. 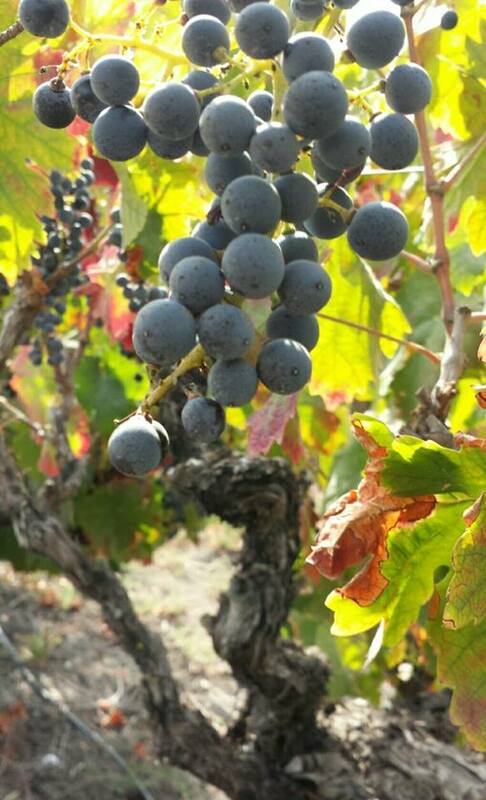 Carignan’s high yield made it an attractive variety for bulk wine production. It is still a major ingredient in cheap blends and has a poor reputation because of this and it has been a bold step by a few producers to make a quality varietal wine from Carignan. In 1999, Yair Margalit produced Israel’s first high-quality varietal Carignan wine. Unfortunately Yair did not continue making Carignan wines. Today over a dozen wineries, most quite small, produce high-quality wines from Carignan grapes. Most of these are from old vines (30-50 years) but some are successful with producing quality Carignan wines from younger vines by careful viticulture to restrict yields. Winemakers had noticed that the lower the yield, the greater the acidity. Carignan is susceptible to brett giving the wines a savoury character, and oidium due to shape of grape cluster. Assaf Paz, brother and brother-in-law to the owners and winemaker at Vitkin Winery, followed Margalit’s lead in creating quality Carignan wines in Israel. He produced his first Carignan at Vitkin in the 2002 vintage. He feels Carignan could be the Pinot Noir of the Mediterranean. 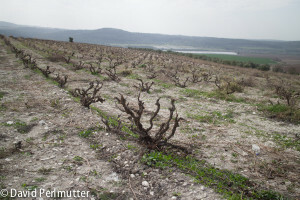 Vines planted in 1976 and 1979, in three different sites near Zichron Ya’acov (Hanadiv Valley), originally trained as cordon and now re-trained as gobelet. Yield of about 30hl/ha. Carignan does very well in hot, dry vintages, such as 2010. Dry farmed, irrigation only when essential. The grapes were harvested late which seems to give Vitkin’s Carignan a rich, velvety fruit character. Cold soaks at 10C, mix of indigenous and bought yeast. Aged in 350L and bigger barrels, rests on lees, for 14-16 months. *Carignan 2010 Ripe bramble (wild blackberry) fruit, soft and spicy aromas. Developing into rich black fruit and dark chocolate on the palate. Very good acidity with wild red berry edge and firm tannins. *Carignan 2009 Intense black perfumed fruit, very elegant acidity with firm tannins. Carignan 2011 Deep purple, ripe black fruit aromas. On palate juicy black fruit, savoury salty tannins. Good acidity, austere, dry, tight with mineral notes and black chocolate tannins. Opening out to show spice and red berry fruit. Tannins ripe and balanced by weight of fruit. These old (planted 1992) bush vines were ‘discovered’ by Ido Lewinsohn, one of the winemakers at Recanati, in 2008 in the Ella Valley (Judaean Hills) and was first made in to a varietal wine in 2009. 30-50hl/ha – depends on the amount of rain in the spring. 48 hours soak. 8-10 days fermentation followed by 1 year in new French oak. Vineyard irrigated for first 10 years and then not irrigated since then. Winemaker Kobi Arviv. The Wild Carignan wine is available at Berry Brothers & Rudd. *Wild Carignan 2013 Spicy aromas, very fresh acidity, very dry structural tannins. Austere, wild berry fruit. Still very young. Harvested late July/early August. Berries were tiny with alot of skin and pip in proportion to juice. Wild Carignan 2011 Red berry fruit, ripe cherries, firm dry tannins. Juicy, fresh acidity. Freshness reflecting the cooler vintage. Founded by Founded by Oran, Tal and Kobi Shaked (the Trio), their first vintage was in 2006. The winemaker is Yotam Sharon. Carignan vines are 40 years old, from near Amikam (inland from Zichron Ya’acov). Fruit very erratic in quality and yield, requiring selection. 25% in new oak, rest in 1 year old oak, 500l barrels. Spirit of Alona Valley Carignan 2012 Very ripe fruit, dry savoury notes, firm tannic structure. Very savoury and austere. Long fresh acidity. Very young. Barkan Winery was founded in the late 19th century and is, today, the second largest winery in Israel. This wine is made from Carignan, normally allowed to produce high yields, machine harvested in Hulda, one of the hottest vineyard regions. Yotam Sharon, the wine maker at the time, selected a parcel of older vines and convinced Barkan to harvest and ferment the fruit separately. Reserve Carignan 2007 Perfumed red fruit aromas. On palate very fresh acidity, black inky tannins, floral notes, rich with amazing acidity and 14.5%! Barak Dahan is the owner and winemaker (fifth-generation farmer in Zichron Ya’akov) of Somek, with, importantly, his own vineyards in the Bekat Hanadiv valley between Zichron Ya’akov and Binyamina. He and his wife started making their own wine in 2003. The Carignan vines are 50 + years old. The wine is aged for 2 years in oak barrels, one-third of which are new. One year in bottle before release. 2011 was a particularly cool vintage. *Carignan 2011 Very intense black fruit aromas followed by juicy black and wild berry fruit and spice. Backed by firm, austere structural tannins and fresh acidity. Carmel Winery was the first winery to be established in Israel in the 1880s. Assaf Paz (Vitkin) was responsible for the first two vintages of the Carmel Old Vines Carignan in the years 2004 and 2005. The 2010 includes 6% Petit Verdot. Winemaker trained in Burgundy. 14 months in medium toast oak, 15% of which were new. The wine was presented by Adam Montefiore. His write up of the tasting and some interesting detail on the history of Carignan in Israel was published in the Jerusalem Post. *Carignan 2010 Oak evident on the nose. Good acidity, dry tannin, long acidity on the finish. Quite sweet ripe fruit (reflecting hot vintage), dry structural tannins. 2012 was the first vintage from the new Jezreel Winery. The winemaker is Ari Erle. Carignan 2012 Quite perfumed aromas, lovely fresh black fruit and firm tannins. Not as powerful and structural as some, more of a fresher style. Vortman Winery was founded 2007. Carignan from vineyards on clay and gravel over limestone in the Dalia Valley between Meir Shfeya, Zichron Ya’akov and Bat Shlomo. Carignan 2013 (+ 20% Syrah and Merlot). Lovely red fruit with good fresh acidity. Ripe with good weight and firm but not dominant tannins. Many thanks to David Perlmutter for organising the original tasting and to all the wineries for providing the wines. Thanks so much for agreeing to lead the tasting enjoyed your write up. That’s great Debra. Lovely interview with Assaf. Can you put the links to the other interviews as well? I was on a press trip to visit the wines of Israel in 2014 and at many of the wineries you mentioned here, I was asking a lot of questions about their Carignan as it was quite a curious thing to discover. One other member of the group yelled at me on the last day screaming, “You and the god damned Carignan! Every winery with the damned Carignan! I would have stabbed you with my fork at lunch but it was plastic!” Obviously he didn’t share my enthusiasm and I’ve since found him and his rather meaningless website to be unpleasant but reading this I see that my curiosity was justified as indeed, there are some unique projects happening. Many thanks for this even if a year in the rears.